QueuePro 201 & 251 offer the durability of a heavy gauge steel post and a cast iron base, ideal for high traffic areas such as airports, large retail stores, stadiums, and arenas. 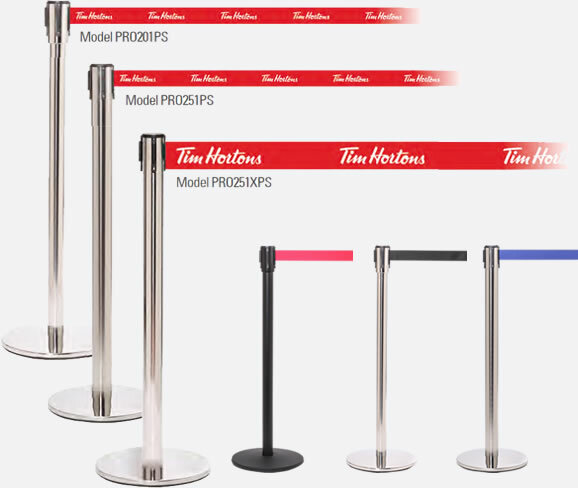 These models are fitted with our Low Profile Base and Universal Belt End which connects to all major stanchion brands. These barriers also offer the advantage of QueuePro’s standard 11’/3.4m belt which requires 45% fewer barriers than with the industry standard 7.5’/2.3m belt. The 251 model is also available in the Xtra version which features a unique 50% wider belt for a more visible barrier and giving much greater impact to logos and messages. Cafes, Restaurants, Pubs, Hotels all benefit from our products.